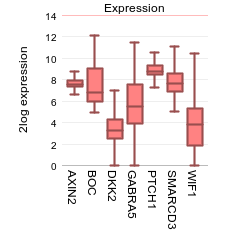 Use R2 to investigate the expression levels of more than 1 gene within a specific dataset. In this example the expression levels of small groups of genes listed from several pathways will be used showing which genes are differentially expressed per subgroup. In R2, the samples are annotated with e.g. clinical data. Each group of annotated data is called a “Track” in R2. These tracks can be used to split the group gene expression levels per track. Use “single dataset” in field 1 and select the “Tumor Medulloblastoma PLoS One - Kool - 62 - MAS5.0 - u133p2” dataset in field 2. To illustrate the possibilities of the multiple gene view. Genes identified as classifiers for Medulloblastoma subtypes (Kool et al, Plos one) will be used. In the GENE/reporter textbox type or copy the following genes: AXIN2,BOC,dkk2,GABRA5,PTCH1,SMARCD3,WIF1 and click next. Figure 1: Default multiple geneview. In Figure 1 a selection of gene expression profiles are depicted in one picture in contrast to the one gene view. The multiple gene view enables the option to represent the gene expression separately for each track. In this manner potential relations between subgroups and gene expression can be visualized. The dataset we are using is described in PLoS One.”2008 Aug 28;3(8), Kool M et al. Here the classification of 5 medulloblastoma subgroups are reported and annotated as such: A,B,C,D and E. To investigate the expression levels of a small group of genes per sub-category select in the adjustable settings box “subtype (cat)” at use track, “lump by group plot gene” at handle groups by and “Track” at color by track. Further set transform tot “none”, select “boxplot” at Plot type and click NEXT. Figure 2: Multiple gene view per track. Also try the “lump by gene plot group” which will produce an image where the genes are shown, separated by the subtypes. The sample filter option allows the user to generate a multiple gene view per track. Some of these functionalities have been developed recently. If you run into any quirks or annoyances don’t hesitate to contact r2 support (r2-support@amc.uva.nl). We hope that this tutorial has been helpful,the R2 support team.